The behavior of complex systems or structures is often not easy to understand or predict and it is often useful to make a simplified model of such a system. Thanks to the computing power of modern computers, such a model, in fact, a mathematical description of the behavior of the system can quickly clarify the behavior of the process. This can serve as a Model Based Design, for feasibility studies or for the design of control systems. Modeling enables the dimensioning of a system in a relatively short period of time and with a minimum number of practical tests or prototypes. Validation through simulations and practical tests ensure that the results of the model are close to reality. If the model is developed represents the real system closely, this model can serve as the basis for Model-Based Design. The design of the system or a structure is then based on the results of the simulation model. For a company, modeling is a good method for quickly calculating concepts and ideas without first developing the entire system. This can significantly save development costs. Feasibility studies are conducted, for example, to determine in advance what energy consumption one can expect when equipping a certain vehicle with a hybrid powertrain. or which dimensions of internal combustion engine, electric motor, hydrogen cell and / or battery size give the highest efficiency. Control Systems are used to control systems or processes. In order to design a control system, it is necessary to first map the process and place it in a model. The model is then immediately used as the basis for the control software that is read into an ECU. One of the special competences you find at HAN-AR is modeling of combustion processes. With the help of specialized software, we are able to predict the effects of engine technical modifications, such as for example other camshaft profiles, EGR, turbo pressure, the functioning of the engine, the power and the emissions. 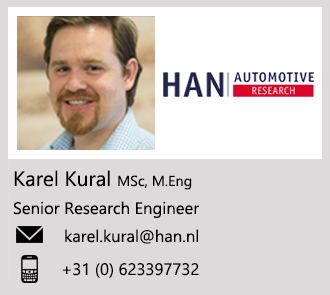 HAN Automotive Research has a very extensive expertise in modeling, both in the field of vehicle technology and beyond. HAN-AR is, therefore, an excellent partner for improving the efficiency of development processes for companies in the SME sector. We work with software from Matlab-Simulink, Symmechanics and GT Power.